The work of post-Impressionist painter Vincent van Gogh has been widely celebrated in the time since his death, at the age of 37, in 1890. In recent years, two Academy Award-winning films featured his work -- "Lust for Life" and "Midnight in Paris" -- though the Dutch artist died believing his life's work was a failure. Legend has it that the artist only sold a single painting in his lifetime, and van Gogh was no star in the art world. He lived a life plagued by self-doubt, crippled by numerous behavioral conditions. When van Gogh completed "The Starry Night," arguably some of his finest work, the artist didn't even think it was any good -- a sentiment the world's initial response seemed to confirm. However, in 1941, the painting became part of the permanent collection of the Museum of Modern Art in New York City; in 1973, a museum in Amsterdam opened with its primary commitment to house works by van Gogh. 1. Vincent van Gogh apparently placed lit candles in his hat so he could paint at night. It is not exactly certain that van Gogh painted with candles lining the brim of his straw hat -- in one letter to his brother, Theo, van Gogh mentions "Starry Night over the Rhone" was painted "actually under a gas jet" -- but the story is often repeated. Viewed thus, men don’t play a very noble role -- well, but that is in fact the case. It doesn’t apply in general, though, because ... does the candle burn for the sake of the moth? If one knew that -- well then -- it might well be worthwhile committing suicide that way. 2. Although it has been believed that Vincent van Gogh committed suicide, he may have been murdered. The Pulitzer Prize-winning biographers Steven Naifeh and Gregory White Smith released a book in 2011, called Van Gogh: The Life, which claimed that van Gogh did not commit suicide but rather a local teen bully murdered him. Art historians have still not fully embraced this theory -- the Van Gogh Museum in Amsterdam still lists his death as a definitive suicide -- but Vanity Fair published an article in November 2014 that featured a forensic scientist's skeptical take on the possibility that van Gogh shot himself, due to the artist's inability to hold the gun so close to his body and the absence of burn marks on his hands. As pointed out in Naifeh and Smith's book; the gun was never found, the easel van Gogh claimed to be painting on was never recovered and the walk van Gogh claims to have taken from a wheat field to an inn where he was staying is unbelievably long for someone with a fatal wound (it was about a mile). Though speculative, the author's also discuss van Gogh's paintings around the time of his death as far too lighthearted and that van Gogh made it clear he was against suicide in various letters. 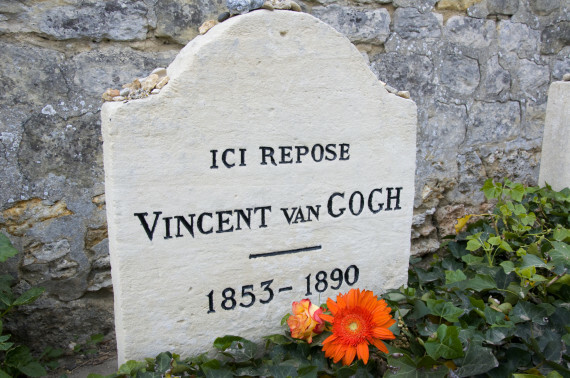 For what it's worth, the idea van Gogh committed suicide did come straight from van Gogh himself, as at the inn he claimed that he wanted to die and refused medical help, saying to his brother, "The sadness will last forever." 3. Somebody else might have cut off Vincent van Gogh's ear. First off, the entirety of van Gogh's ear was not removed. A portion of his left earlobe was cut off. According to a report by Le Petit Journal, just three days after the incident, van Gogh did in fact give a part of his earlobe to a prostitute, but whether he cut the earlobe off himself is highly questionable. Van Gogh had been living with friend and fellow artist Paul Gauguin at the time of the incident. Gauguin was an expert fencer. The two would often fight violently, and the night van Gogh's earlobe was cut was no exception. Although the two both claimed that van Gogh had cut the earlobe off himself, this may have been to cover up shame on the Dutch artist's part. Also, van Gogh may have had a tendency to lie. Van Gogh liked Gauguin more than Gauguin liked him and van Gogh's brother, Theo, had gone so far as to bribe Gauguin to keep living in the house. For some reason, van Gogh claimed he had no recollection of the night, although he did write to Theo: "Luckily Gauguin ... is not yet armed with machine guns and other dangerous war weapons." 4. Vincent van Gogh painted "The Starry Night" while peering out the window as a self-admitted patient at the Saint-Paul asylum in Saint-Rémy. It pains me to know that you’re still in a state of incomplete health. Although nothing in your letter betrays weakness of mind, on the contrary, the fact that you judge it necessary to enter an asylum is quite serious in itself. Let’s hope that this will be merely a preventive measure. As I know you well enough to believe you capable of all the sacrifices imaginable, I’ve thought that there’s a possibility that you may have thought of this solution to encumber less those who know you. While in the asylum, van Gogh painted many of his now classic works, including "Irises," "The Olive Trees" and "The Starry Night." Van Gogh referred to "The Starry Night" as a failure. Writing his brother, the artist stated that he would be mailing several his way (which Theo tried to sell without success). Van Gogh noted that the painting "says nothing to me." It was not even "a little good," he wrote, like other paintings mentioned in the letter. Without enough postage to send all the paintings he had intended, "The Starry Night" was left out of the package. 5. Growing up, Vincent van Gogh would walk by a tombstone with his own name, due to the early death of his infant brother. Van Gogh was born and raised in Zundert, Netherlands. His father, Theo van Gogh, was named pastor of a Dutch Reformed church in 1849. Van Gogh's brother by the same name, Vincent, died as a baby and is buried in the church that still stands today. Zundert still celebrates itself as the birthplace of van Gogh. The town includes Vincent van Gogh Square, commemorative statues of van Gogh and his brother, Theo, and a Vincent van Gogh house. The original house on the Zundert main street at Markt 29 was unfortunately torn down. 6. Vincent van Gogh didn't start painting until he was 27 or 28, but his oeuvre included nearly 900 works -- an average of about 2 per week -- before he died at 37. Theo, I am so very happy with my paintbox, and I think my getting it now, after having drawn almost exclusively for at least a year, better than if I had started with it immediately ... For, Theo, with painting my real career begins. Don't you think I am right to consider it so? Van Gogh created almost 900 paintings and more than 1,100 works on paper before his death. Prolific, yes, but van Gogh may have had a form of epilepsy (which he was diagnosed with in his lifetime) and a behavioral condition called hypergraphia which causes those afflicted to have an intense need to write, or, in van Gogh's case, paint. 7. The distinct yellows that Vincent Van Gogh used in his paintings have faded and browned over time. Van Gogh used a signature yellow in his paintings that was made possible by the industrial revolution and a new pigment called chrome yellow, a "toxic lead chromate and like many of the pigments of the period was chemically unstable." Unfortunately these yellows, used in paintings such as "Bedroom in Arles," have significantly faded and browned over the years and so contemporary viewers aren't quite seeing the original luminance of the works. This change is permanent, according to Koen Janssens, the leader of a group of researchers who tested samples of the browning paint. "To reverse this chemical reaction would likely cause more damage to the paintings,” he said. 8. The oldest living person met Vincent van Gogh in her lifetime and remembered him as "dirty, badly dressed and disagreeable." Born in 1875, Jeanne Calment had the longest confirmed human lifespan when she died in 1997 at 122. She lived her life in Arles, France, where van Gogh spent time in 1888. During that year, van Gogh came to a shop Calment's uncle owned to buy paints. Calment later described van Gogh as "dirty, badly dressed and disagreeable." BONUS: Vincent van Gogh painted over 30 self-portraits, but photographs of the artist may exist. 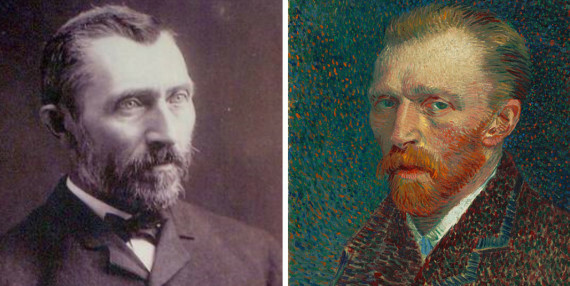 The portrait (at right) is an oil painting by van Gogh, completed Dec. 31, 1886; the photograph (at left) was also taken in 1886. It was bought at an antique store for $1 in the early 1990s. Forensic scientists believed they confirmed it was an original photograph of van Gogh in 2004. The Van Gogh Museum did not authenticate the photograph at the time and only a handful of photos of van Gogh at a much younger age have been deemed real. The address below the photo has also been called into question as it marks a Canadian location, and van Gogh never lived outside of Europe. The eyes seem a bit unfamiliar, but maybe it just takes an impressionist's vision to fully see the resemblance. CORRECTION: A previous version of this article incorrectly stated Vincent van Gogh's older brother, Vincent, died at the age of one when the death was actually a stillbirth.